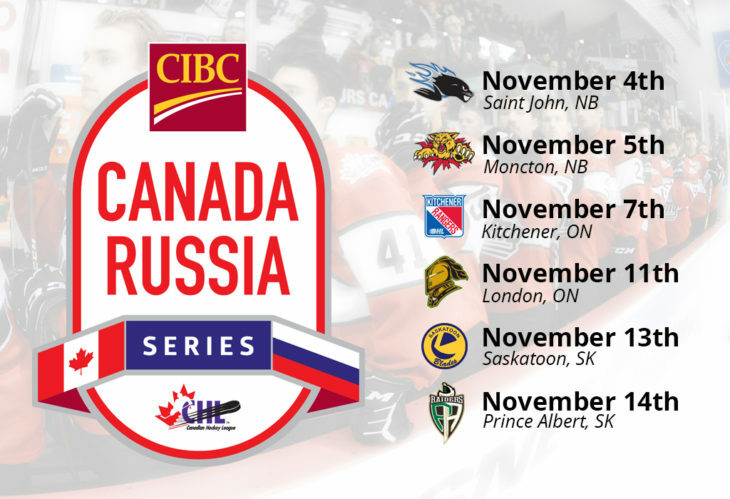 Russia captured the CIBC Canada Russia Series for the fourth time, taking an 11-7 victory in points. Hockey Canada's Brad McEwen gives us his evaluation of Team QMJHL's performance in games 5 & 6 at the 2018 CIBC Canada Russia Series. Hockey Canada's Brad McEwen gives us his evaluation of Team OHL's performance in games 3 & 4 at the 2018 CIBC Canada Russia Series. Hockey Canada's Brad McEwen gives us his evaluation of Team WHL's performance in games 1 & 2 at the 2018 CIBC Canada Russia Series. Russia captured its first CIBC Canada Russia Series title since 2014, defeating the CHL 11-7 in points with a Game 6 overtime victory. Rimouski's Dmitry Zavgorodniy scored the game-tying then assisted on the OT game-winning-goal in a 3-2 Team Russia series win over Team QMJHL. Hear from Team QMJHL’s Pierre-Olivier Joseph and Noah Dobson following Game 6 of the 2018 CIBC Canada Russia Series. Hear from Team Russia's Dmitry Zavgorodniy following a series clinching win over Team QMJHL. Hear from Team QMJHL head coach Jim Hulton following of Game 6 of the 2018 CIBC Canada Russia Series. Images from Game 6 of the 2018 CIBC Canada Russia Series in Drummondville, QC. Sportsnet's RJ Broadhead and Sam Cosentino break down Game 6 of the 2018 CIBC Canada Russia Series where Team Russia defeated Team QMJHL in OT to clinch the series. Pierre-Olivier Joseph of the Charlottetown Islanders, Antoine Morand of the Halifax Mooseheads and Nicolas Beaudin of the Drummondville Volitgeurs headline Team QMJHL’s Players to Watch. Joe Veleno, Olivier Rodrigue and Nicolas Beaudin are three of the five Drummondville Voltigeurs suiting up tonight before the home crowd in Drummondville. Team QMJHL's Antoine Morand and Olivier Rodrigue talk about the shootout competition in practice. Hear from Team QMJHL head coach Jim Hulton ahead of Game 6 of the 2018 CIBC Canada Russia Series. Sportsnet’s RJ Broadhead and Sam Cosentino preview Game 6 of the 2018 CIBC Canada Russia Series in Drummondville. A look ahead to a sixth and deciding game of the 2018 CIBC Canada Russia Series in Drummondville, QC. New York Islanders prospect, Noah Dobson of the Acadie-Bathurst Titan wore a helmet-cam during Team QMJHL’s off-day practice in Sherbrooke. Hear from Team QMJHL’s Nicolas Beaudin and Raphael Lavoie following on their off-day in the 2018 CIBC Canada Russia Series.